An abscess is an accumulation of pus made up of dead white blood cells that become walled off in a capsule in the horse's body, feet or head. In the case of a dental abscess, the capsule is usually accompanied by inflammation and becomes very painful, due to the buildup of pressure as the dying white blood cells accumulate in the capsule. As time passes, the abscess can rupture, releasing pus. Horses do not usually develop cavities in their teeth. Instead, dental infections usually begin at the root of the tooth and are often preceded by gum infection which leads to an abscess. When the gums are infected, small pockets and crevices along the edges of the gums trap food, the pockets and crevices then become infected. The infection works its way into the pulp cavity leading to root abscesses and bone infection. When the abscess affects the root of the tooth root, the abscesses are known as apical infections. An apical infection is when there is a bacterial infection located at the apex of a cheek tooth whether it is located in the upper or lower jaw or affects an incisor. Often the cheek teeth in the upper jaw become infected and since the roots of these teeth are imbedded in the maxillary sinuses, they cause bacterial sinusitis and a purulent, foul-smelling discharge through the nostril occurs. A fistula or abnormal passage may develop between the oral and nasal cavities, making it necessary to extract the tooth to cure the infection. Clinical signs of abscesses vary with each case depending on the site and severity. Some horses have a warm painful swelling or a draining tract located in or on the jaw. The horse may have bad breath, show a decrease in appetite, and exhibit head tossing or reluctance to be bridled. The horse with a dental problem may be reluctant to take the bit, shake its head when being ridden, or resist training due to discomfort in his mouth. The average horse chews about 60,000 bites per day! His mouth plays a very important role in his overall health. Lack of dental care can lead to number of problems, including colic, weight loss and issues under saddle. In addition, the classic signs of dental disease in horses may indicate a tooth abscess. These include difficulty or slowness in feeding and a reluctance to drink cold water. While chewing, the horse may stop for a few moments and then start again. Sometimes, the horse will hold its head to one side as if it were in pain. To avoid using a painful tooth or a sore mouth, the horse may swallow its food before chewing it, leading to indigestion, colic, or choke. Unchewed grain and coarse unchewed forage may be noticed in the manure. Other signs of dental disease or abscesses in horses include excessive drooling and blood-tinged mucus in the mouth. Because of a lack of desire to eat because of the associated pain, the horse may lose body condition and his coat may be in a poor condition. In addition, tooth root abscesses are a common cause of a snotty nose in a horse, although snotty noses can be caused by upper respiratory infections such as influenza, equine herpes virus or lower respiratory infections such as pneumonia. 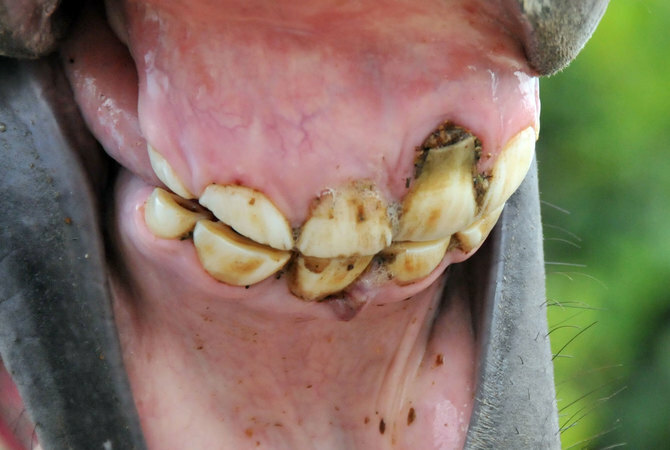 According to R. Brad Tanner, DVM,of Rood and Riddle Equine Hospital, tooth root infection in the horse is a relatively common disorder occurring primarily in the cheek teeth. Upper and lower cheek teeth have been reported to become infected at similar rates. The terms tooth root abscess and tooth root infection are synonymous, though a more accurate term is apical infection. Apical refers to the tooth root area and surrounding tissue. The cheek tooth of a horse is very long and often the apical infection includes not only the tooth but also the periodontal ligament, surrounding bone and potentially sinuses. The reported median age of horses with cheek teeth infections is 5-7 years but these infections can occur at any age. Causes of apical infections are numerous including fractures, developmental disorders, and blood borne pathogens. Developmental disorders include too numerous cheek teeth, which creates overcrowding and can lead to incomplete eruption or impaction of cheek teeth. Also, too few cheek teeth can leave gaps between teeth and increase the chance of periodontal disease. Perhaps the most common cause of apical infections leading to abscesses is the spread of bacteria in the blood. The horse has a tremendous blood supply to erupting teeth and may explain why more of these infections are seen in young horses that have rapidly developing tooth roots. A thorough oral exam with a mouth speculum is needed to determine if there is a problem with a cheek tooth. This examination should include a dental mirror and probe to evaluate the grinding surface of any tooth that is suspected of infection. An oral exam alone is often not enough. Radiographs of the suspicious area are the best way to determine if an abscess is present. Dental extraction of the infected tooth is most often the necessary treatment for an apical infection that has lead to an abscess. These infected cheek teeth can be extracted orally with few complications if the exposed crown of the tooth is large enough to be grasped and if the tooth does not have a fracture below the gum level. If there is no sinus involvement with the infection, the care of a horse after cheek tooth extraction is relatively simple. The empty tooth socket is filled with antibiotic and a plug is made with dental impression material to fill the hole created by the missing tooth. The plug is removed in two weeks and the horse is re-evaluated. Long term after care includes routine biannual floating to assure that the opposing tooth does not grow to form a step defect. In young horses the adjacent cheek teeth will slowly migrate to eventually fill the void left by the missing tooth. Routine dental floating performed by a knowledgeable and experienced practitioner can alleviate pain and prevent many dental disorders. Dentistry is an important part of the overall health and well being of the horse. It is recommended that adult horses have their teeth floated once per year and that horses younger than 5 years of age have teeth floated twice per year. In younger horses it is important to evaluate the development of permanent teeth as well as the shedding of their immature teeth known as caps. Geriatric horses have their own special needs and should be evaluated annually or more often.